Home National News & Views New Orleans The incarceration capitol of the U.S. The incarceration capitol of the U.S.
New Orleans’ criminal justice system is at a crossroads. A new mayor and police chief say they want to make major changes, and the police department is facing lawsuits and federal investigations that may profoundly change the department. But a simultaneous, and less publicized, struggle is being waged and the results will likely define the city’s justice system for a generation: The city’s jail, damaged in Katrina, needs to be replaced. City leaders must now decide how big the new institution will be. 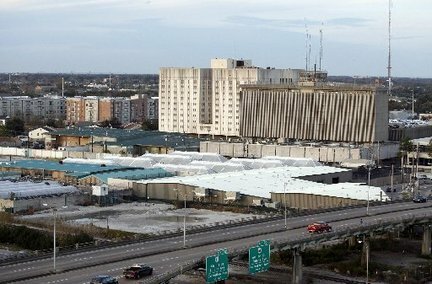 With 3,500 beds in a city of about 350,000 residents, Orleans Parish Prison (OPP) is already the largest per capita county jail of any major U.S. city. Sheriff Marlin Gusman, the elected official with oversight over the jail, has submitted plans for an even larger complex. A broad coalition of community members is seeking to take the city in a different direction. They want a smaller facility, and they are demanding that the money that would be spent on a larger jail be diverted to alternatives to incarceration, like drug treatment programs and mental health facilities. At first, it seemed like an expansion of OPP was inevitable. This is a city with one of the highest rates of violent crime in the U.S., and politicians rarely lose votes by calling for more jail cells. But in a city that has led the nation in incarceration, residents across race and class lines are questioning fundamental assumptions about what works in criminal justice. A broad array of criminal justice experts and community leaders has spoken in favor of a smaller jail. This is an issue that has allowed the religious foundation Baptist Community Ministries and prison abolition organizers from Critical Resistance to find common ground. The online activist group ColorOfChange.org also recently joined in the conversation, with an appeal that has generated hundreds of emails to the mayor and city council. A broad array of criminal justice experts and community leaders has spoken in favor of a smaller jail. The OPP Reform Coalition, a pre-Katrina alliance that has recently been revitalized, has led the campaign. In September, when it seemed like the prison expansion was proceeding without public debate, they took out a full-page ad in the city’s daily paper listing other things that the money spent on OPP could be spent on. The ad featured an assortment of New Orleanians – including musicians, local politicians, community leaders, and members of the cast and crew of the HBO show Treme. The diverse assembly of public figures not only signed the ad, but also helped pay for it, donating $22.39 each, the amount that the jail currently charges the city for every prisoner. In the aftermath of the ad, attention turned to a working group formed by the mayor to address the issue. Orleans Parish Prison is a giant complex in Midcity New Orleans, made up of several buildings spread across a dozen blocks employing nearly a thousand nonunion workers. The city jail is a small empire under the absolute control of the city sheriff, who can use jail employees for election campaigns and send out prisoners to work for local businesses. The majority of the metropolitan area’s mental health facilities are also located within the jail, meaning that for many who have mental health issues, the jail is their only option for treatment. Louisiana’s incarceration rate is by far the highest in the world – more than 10 times higher than most European countries and 20 times higher than Japan. Pre-Katrina, OPP had 7,200 beds. In a city with a population of about 465,000, this came to about one bed for every 65 city residents. Neighboring Jefferson Parish has 100,000 more people than Orleans Parish and has only 900 beds. Caddo Parish – in the northeast of the state – has more violent crime but still imprisons far fewer people. If OPP had the same number of beds as the national average of one for every 388 residents, the jail would shrink to about 850 beds. Aside from its size, OPP is unique in other ways. Under the terms of a lawsuit over prison conditions filed in 1969, the jail’s budget is based on a per-diem paid by the city for every inmate in prison. The more people locked in OPP, the higher the funding Sheriff Gusman has at his disposal. “Our current funding structure is creating a perverse incentive to lock more people up,” explains Dana Kaplan, the director of Juvenile Justice Project of Louisiana, a criminal justice advocacy organization and member of the OPP Reform Coalition. Under the terms of a lawsuit over prison conditions filed in 1969, the jail’s budget is based on a per-diem paid by the city for every inmate in prison. The more people locked in OPP, the higher the funding Sheriff Gusman has at his disposal. The institution of OPP is also exceptional in that it is a county jail and a state prison combined into one entity. About 2,700 people in the jail are mostly pre-trial detainees – the majority being held for drug possession, traffic violations, public drunkenness or other nonviolent offenses – and are legally innocent. An additional 800 people are state prisoners who have been convicted in court, who may spend years or even decades at OPP. Almost 60,000 people passed through OPP in the last 12 months, a staggering figure for a city of this size. The average length of stay was 20 days. The largest portion of pre-trial prisoners in the jail are there for nonviolent, municipal offenses that even under conservative standards should not warrant jail time, including 20,000 arrests this year for traffic violations. Ultimately, this struggle over the size of the jail is also about the city’s incarceration priorities. If the city builds a larger jail, it will have to keep filling it with tens of thousands of people. If a smaller facility is built, it will change who is arrested in the city and how long they spend behind bars. Because much of the jail was underwater during Katrina, many of the buildings have either been closed or need massive renovation. By one estimate, the new jail that the sheriff seeks would cost $250 million, much of that to come in reimbursements from FEMA. The sheriff has yet to reveal how much of the construction costs would come from federal dollars, although the state chapter of the ACLU has filed a Freedom of Information Act request for the information. Even if most of the construction were paid for by FEMA, as the sheriff has indicated, the continued upkeep would fall to the city. Sheriff Gusman did not respond to requests for comment, but he has said, at a meeting of mayor’s task force on the jail, “I’ve always advocated for a smaller facility,” and spoke of being satisfied with 4,200 beds. The plans he has submitted to various planning bodies, however, indicate otherwise. The sheriff has issued several conflicting statements and reports about the size of the jail he is seeking, as well as where the funding will come from. A “Justice Facilities Master Plan,” prepared in collaboration with the Sheriff’s Office, called for 8,000 beds, which would give the jail capacity to imprison nearly one of every 40 people currently in the city. A planning document recently prepared by the sheriff called for 5,800 beds. No plans or public documents issued by his office have called for building a jail smaller than the current facility. In the aftermath of Hurricane Katrina, thousands of people who had not been convicted of any crime were lost in the city’s prison system. Last month a jury awarded two men from Ohio a $650,000 judgment for their treatment after the storm. The men were on a road trip and stopped in New Orleans for a drink on Bourbon Street. They were arrested for public drunkenness and spent a month disappeared in the system, without being allowed even one phone call to their families. In the aftermath of Hurricane Katrina, thousands of people who had not been convicted of any crime were lost in the city’s prison system. “Parents are crying out, saying where’s the recreation for our children?” explains Andrea Slocum, an organizer with Critical Resistance. Slocum says that when she talks to city residents, the idea of redirecting money from the prison has wide support. “It’s an exciting time for the city in a lot of ways,” says Michael Jacobson of the Vera Institute of Justice, a nonprofit organization that has been advising the city, including the sheriff. Jacobson, who served as correction commissioner for New York City in the mid-‘90s, managed to reduce the population of New York City’s jail system even in the midst of the mass arrests of the Giuliani administration. He believes similar change is possible in New Orleans. “You can’t create or innovate unless you’re willing to step out and change what you’re doing,” he says. The Vera Institute has received funding from the U.S. Department of Justice for a pre-trial services program that has reduced incarceration in other cities, and they project New Orleans will also be able to see a reduction. But the drive to build more jail cells is hard to stop, and many barriers remain. Sheriffs in Louisiana have no term limits, and there are few leverages on their influence. Sheriff Gusman was first elected in 2004 and has faced little opposition since then. The previous criminal sheriff held the position for 30 years, only leaving when he ran for state attorney general. Meanwhile, the Sheriff’s Department has begun construction on a building to hold 400 additional beds. He initially told reporters that he would close other facilities and the new construction would not add up to additional capacity. However, in a letter to the State Bond Commission, he predicted increased revenue from holding additional inmates. Jordan Flaherty is a journalist and staffer with the Louisiana Justice Institute. He was the first writer to bring the story of the Jena Six to a national audience, and his award-winning reporting from the Gulf Coast has been featured in a range of outlets including the New York Times, Mother Jones and Argentina’s Clarin newspaper. He has produced news segments for Al-Jazeera, TeleSur and Democracy Now and appeared as a guest on CNN Morning, Anderson Cooper 360 and Keep Hope Alive with the Rev. Jesse Jackson. His new book is “Floodlines: Community and Resistance from Katrina to the Jena Six.” He can be reached at neworleans@leftturn.org, and more information about Floodlines can be found at floodlines.org. Jordan is currently traveling with the Community and Resistance Tour. For more information on the tour, see communityandresistance.wordpress.com. Stop OPPression in New Orleans! from Critical Resistance on Vimeo. New Orleans Sheriff Marlon Gusman and other city officials are trying to push forward the expansion of the notorious Orleans Parish Prison (OPP) which would add 5,800 new beds, extend the prison nine or 10 city blocks and cost $250 million. Orleans Parish Prison is already the largest per capita county jail of any major U.S. city, while resources for housing, education, job training and health care continue to be cut or remain deeply underfunded. In an effort to stop construction and shrink the prison system in the city, Critical Resistance New Orleans has been working nonstop with allies and community members trying to build people power in order to shift vital resources away from the prison industrial complex and toward building thriving, sustainable, self-determined communities. For more information and to get involved, contact CR New Orleans, 930 N. Broad St., New Orleans, LA 70119, (504) 304-3784 or crno@criticalresistance.org.